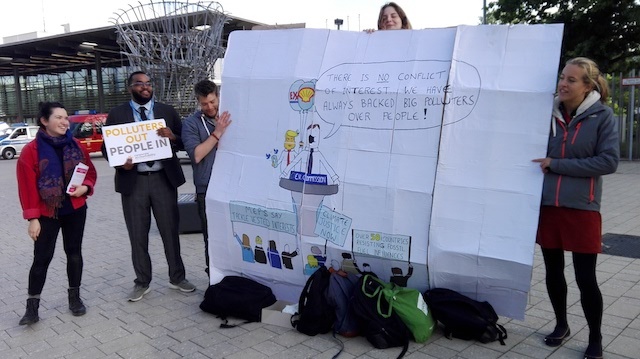 BONN, May 15 2018 (IPS) - As negotiators concluded ten days of climate talks in Bonn last week, climate finance was underlined as a key element without which the Paris Agreement’s operational guidelines would be meaningless. The talks, held from April 30 to May 10, were aimed at finalising the PA’s implementation guidelines to be adopted at the annual climate conference to be held in Katowice, Poland in December. The guidelines are essential for determining whether total world emissions are declining fast enough to achieve the goals of the Paris Agreement, which include boosting adaptation and limiting the global temperature increase to well below 2°C, while pursuing efforts to limit the increase to 1.5°C. However, the catch is that all this requires financing to achieve. For instance, the conditional Nationally Determined Contributions (NDCs) from developing countries in implementing the Paris Agreement are pegged at the cost of 4.3 trillion dollars to be achieved. It has always been the cry of developing countries to receive support through predictable and sustainable finance for it is the lifeblood of implementation of mitigation and/or adaptation activities. And Least Developed Countries (LDC) Chair Gebru Jember Endalew agrees with Zambia’s Shitima on the importance of finance. “Finance is key to meeting the goals of the Paris Agreement. In the face of climate change, poor and vulnerable countries are forced to address loss and damage and adapt to a changing climate, all while striving to lift their people out of poverty without repeating the mistakes of an economy built on fossil fuels. This is not possible without predictable and sustainable support,” he said. The civil society movement was particularly unhappy with the lukewarm finance dialogue outcome. “The radio silence on money has sown fears among poor countries that their wealthier counterparts are not serious about honouring their promises,” said Mohamed Adow, International Climate Lead, Christian Aid. He said funding is not just a bargaining chip, but an essential tool for delivering the national plans that make up the Paris Agreement. And adding his voice to the debate, Mithika Mwenda of the Pan African Justice Allaince (PACJA) expressed dismay at the lack of concrete commitments from developed country parties. “We are dismayed with the shifting of goal posts by our partners who intend to delay the realization of actual financing of full costs of adaptation in Africa,” said Mwenda. 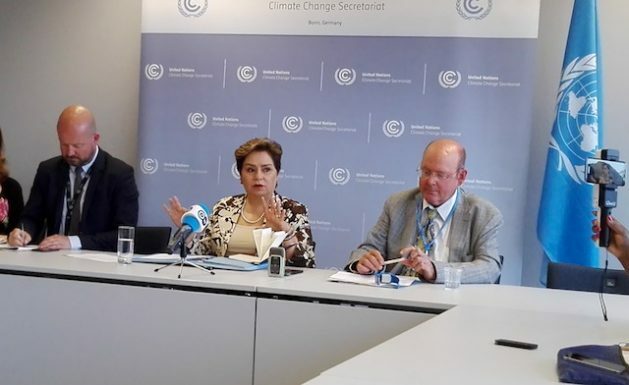 But for Patricia Espinosa, Executive Secretary of the UN Framework Convention on Climate Change (UNFCCC), the final analysis of the talks revealed a more hopeful outlook. According to Espinosa, the presiding officers of the three working bodies coordinated discussions on a wide range of items under the Paris Agreement Work Programme, and delegations tasked them to publish a “reflection note” to help governments prepare for the next round of talks. She said the preparatory talks would continue at a supplementary meeting in Bangkok from September 3-8, at which the reflection note and the views and inputs by governments captured in various texts in Bonn would be considered. The Bangkok meeting would then forward texts and draft decisions for adoption to the annual session of the Conference of the Parties (COP24) in Poland. “We have made progress here in Bonn, but we need now to accelerate the negotiations. Continuing intersessional streamlining of the text-based output from Bonn will greatly assist all governments, who will meet in Bangkok to work towards clear options for the final set of implementation guidelines,” she explained. In parallel to the formal negotiations, the Bonn meeting hosted the long-awaited Fiji-led Talanoa Dialogue. Following the tradition in the Pacific region, the goal of a ‘talanoa’ is to share stories to find solutions for the common good. In this spirit, the dialogue witnessed some 250 participants share their stories, providing fresh ideas and renewed determination to raise ambition. The dialogue wrote history when countries and non-Party stakeholders including cities, businesses, investors and regions engaged in interactive story-telling for the first time. “The Talanoa Dialogue has provided a broad and real picture of where we are and has set a new standard of conversation,” said the President-designate of COP24, Michał Kurtyka of Poland. “Now it is time to move from this preparatory phase of the dialogue to prepare for its political phase, which will take place at COP24,” he added. All input received to date and up to October 29, 2018 will feed into the Talanoa Dialogue’s second, more political phase at COP24. Farmers are particularly vulnerable to climate change impacts such as prolonged droughts and shifting rainfall patterns, and agriculture is an important source of emissions. Despite this importance however, agriculture had been missing and was only discussed as an appendage at the UN climate negotiating table, until November 2017 when it was included as a work programme. Recognising the urgency of addressing this sector, the Bonn conference made a significant advance on the “Koronivia Joint Work on Agriculture” by adopting a roadmap for the next two-and-a-half years. “From our perspective as Zambia, our interest is in line with the expectations of the African group which is seeking to protect our smallholders who are the majority producers from the negative impacts of climate change,” said Morton Mwanza, Zambia’s Ministry of Agriculture focal point person on Climate Smart Agriculture. And according to the outcome at the Bonn talks, the roadmap responds to the world’s farming community of more than 1 billion people and to the 800 million people who live in food-insecure circumstances, mainly in developing countries. It addresses a range of issues including the socio-economic and food-security dimensions of climate change, assessments of adaptation in agriculture, co-benefits and resilience, and livestock management. Nevertheless, key to this roadmap is undoubtedly means of implementation—finance and technology. Developed countries pledged, since 2009, to deliver to developing countries 100 billion dollars per year by 2020 for climate action. However, the withdrawal of 2 billion dollars’ worth of support by the Trump administration because of its decision to leave the Paris Agreement, leaves the climate finance debate unsettled, and a major sticking point in the talks. And some campaigners now accuse some fossil fuel lobbyists allegedly sitting on the negotiating table to be behind delayed climate action. According to a study, titled “Revolving doors and the fossil fuel industry,” carried out in 13 European countries, failure to deal with conflict of interest by the EU is due to cosy relationships built up with the fossil fuel sector over the years. It calls for the adoption of a strong conflict of interest policy that would avoid the disproportionate influence of the fossil fuel industry on the international climate change negotiations. And so, it seems, climate finance holds all the cards. Until it is sorted, the implementation of the Paris Agreement in two years’ time hangs in the balance.